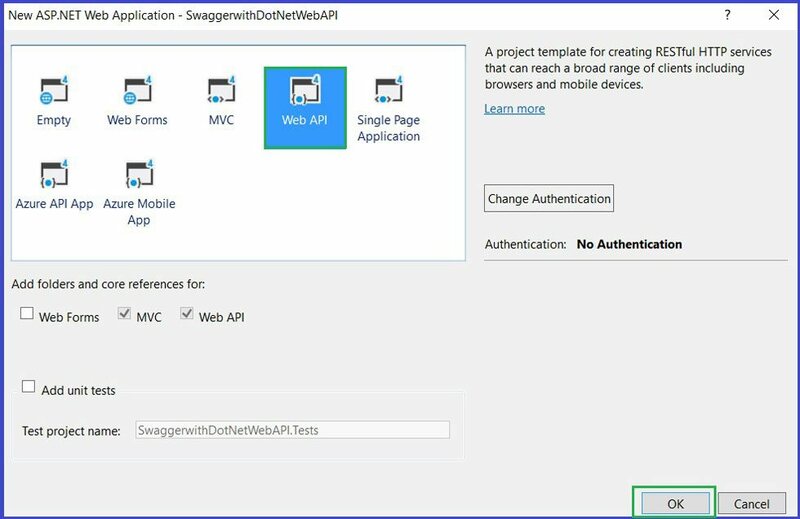 In this article, we shall see how to implement, customize Swagger in ASP.NET Web API. .NET Framework 4.x installed in your machine. Documentation always stands as an vital part with APIs designing. Swagger comes in as a documentation of RESTful APIs detailing its methods, parameters with datatype to be used along with output schema and headers information. Swagger is representation of RESTful APIs endpoints. It helps developer consuming API, to understand methods definitions without actually looking into code written behind it. Consumers of APIs can visualize endpoints, helping in to better understanding of service and its methods. 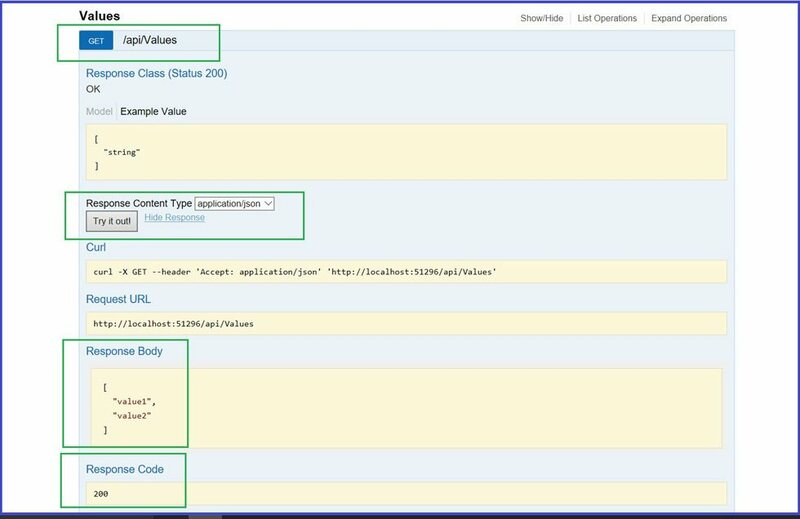 In very simpler terms, Swagger helps in providing detailed specifications in a Visualize manner of RESTful Web APIs. Open Visual Studio (article is using Visual Studio 2017), create new ASP.NET Web project and give project a Name. 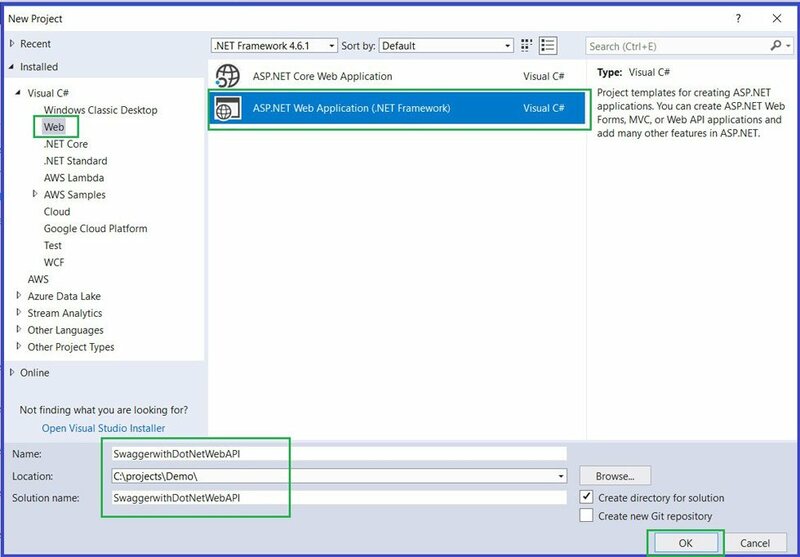 Select Web API as project template, and click Ok. 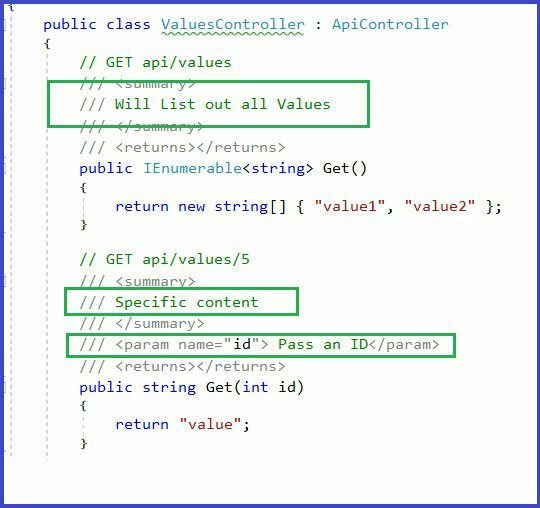 This will create a basic ASP.NET Web API with controller name Values. Would display result as seen below, executing Get method of Value Controller. 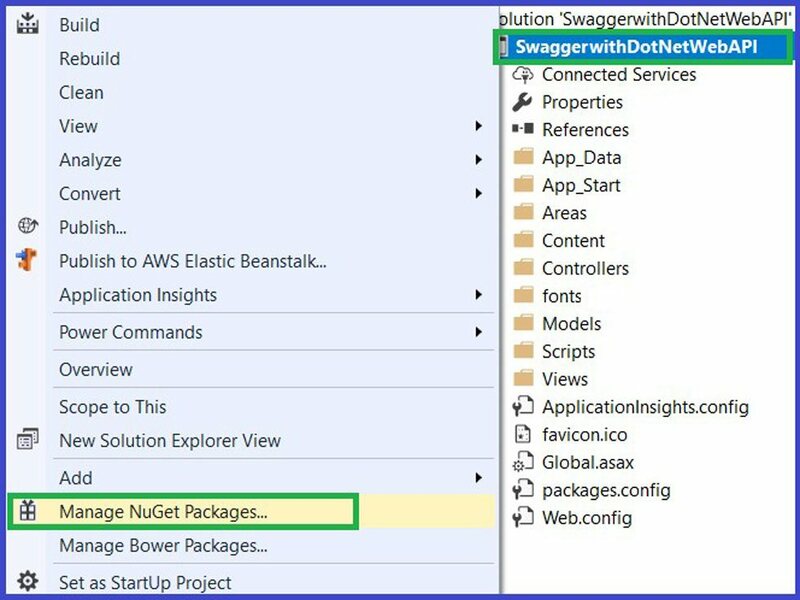 Right Click on Project ad select Manage NuGet Packages. Type, ‘Swashbuckle’ in search box. Check ‘’Ínclude prerelease’ checkbox and press enter. This will list project as shown in below image. Select the one as shown , and click on Install. This will install all the required reference libraries required for Swashbuckle project. Go to Solution Explorer and check project folder App_Start. A new file name SwaggerConfig.cs will be added to said folder. This confirms our successful installation of Swashbuckle project. Build project and press Ctrl + F5 to launch the Web API. This will list all the methods of Value controller as seen in below image. 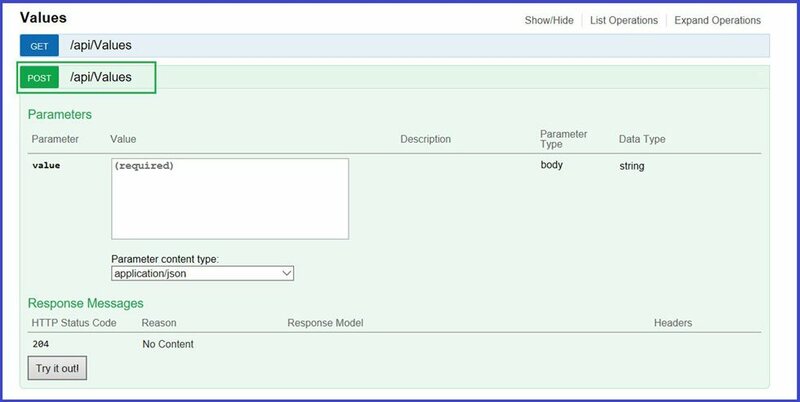 Click on any tab listed, and it open up with details like parameter expected to be enter, its Output schema along with a Try It Out button to test the endpoint. On clicking said button, it displays the desired output with Response Body and Response Code. 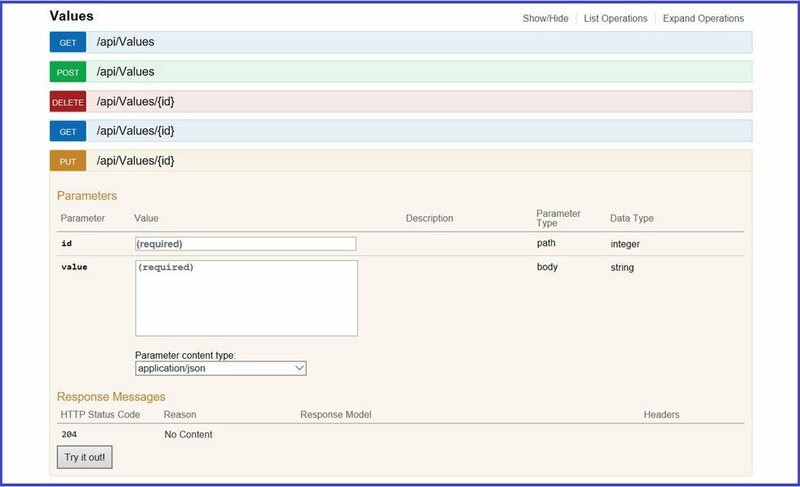 In this article, we shall customize our Swagger UI with implementation of displaying Methods comments, added in code file. It’s always recommended to enter comments for methods stating details about the endpoint. Details like what does that particular method or endpoint returns, any information about the parameter being passed and so on. Our objective is API should be understandable or readable for Consumers and Clients consuming API. Question will arise, comments are made in code, then how it would be helpful for client. Answer is Swagger again. Yes, Swashbuckle a has a provision to display these comments, written in code, in to Swagger UI. For GET method, add few lines of code above method section. 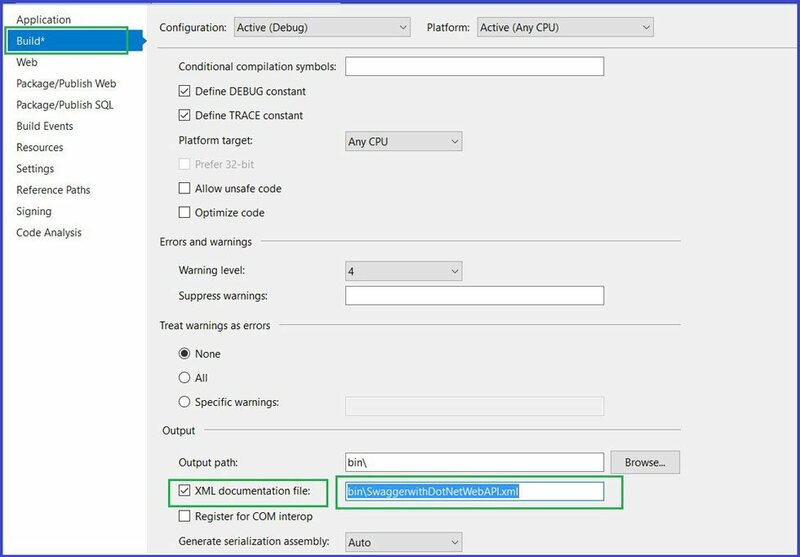 Also add few information regarding parameter id being passed, as shown in below image. 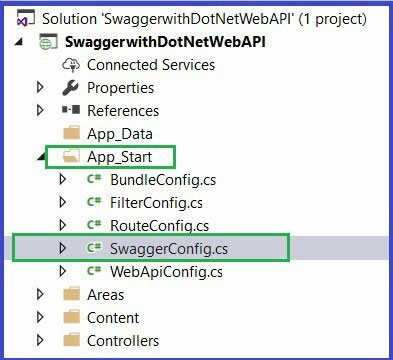 After adding comments, go to App_Start folder and open SwaggerConfig.cs file. Once you are on said line, uncomment the code. Method name ‘GetXmlCommentsPath()’ is created. Go to Solution Explorer, Right Click on project and Click on Properties. Now, click on Tab Name Build at left pane. Under Output section, Check the box ‘ XML documentation file’ and copy the path being displayed. At this path an XML document is being generated with all the comments added. Return the newly added method in SwaggerConfig.cs, with copied XML location. Comments are now displayed against the method. Chirag Tumar, A 5-years experienced developer in Nexsoftsys, has vast knowledge about content writing. Nexsoftsys is an Offshore ASP.NET development Company India. Chirag wrote many technical content from his experience.